In preparation for working on post-production for Biola's next Japan film, Persimmon (which you will hear more about in the future I'm sure), I'm watching lots of Japanese films, because frankly I'm very unfamiliar with them. 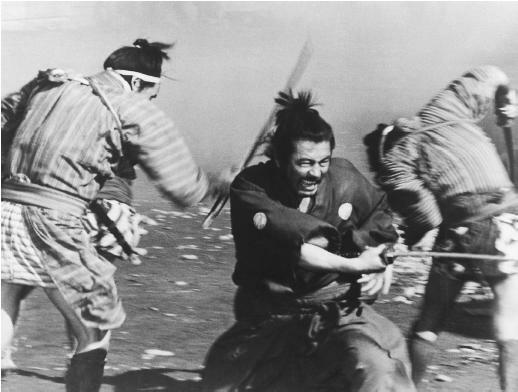 I started my series off with Yojimbo, and was nicely eased into Japanese Cinema. Having already seen Fistful of Dollars, which was based on Yojimbo, I was already familiar with the plot line and general themes. It really felt like a western, in shot composition and set design. The pacing of the film was slower, but I'm not sure if it's because it's a Japanese film, or just the time period it was made in. I guess I'll have to keep an eye on the editing and pacing of the films as I watch more. I loved the plot of Fistful of Dollars, and consequently I loved Yojimbo's as well. One lone man plays both crime lords off of each other to their own demise. While he probably could have killed them all himself if needed, he lets them take care of the work for him. Both sides are greedy and desperate enough to continually hire him, even after he's betrayed them! The samurai knows this too, and uses it to his advantage. Even after he's been captured, he can still manipulate the men! While the men in the town are corrupt enough that you don't really mind their deaths, there are still a lot of men killed in this film. It seems as if the samurai is a bringer of judgement, come to wipe all of the corruption out of the town. It has gotten so bad that there is no hope for the people there, the only answer to bring peace to the town appears to be the death of all the criminals. The problem, though, is that it seems the samurai isn't a perfect judge. He himself seems subject to the same greed as the criminals. Perhaps he is just using money because it's the only way to get to the criminals, but it doesn't always seem that way. He also seems to have no compassion for those who can't stand up for themselves, like the family he must save. I'm not sure why he saved them, but he seemed quickly upset with them when they were "pathetic." Does a judge need to be free of the vice he is judging in others? Or could he be sent by a higher power? Or was the sin of the town so bad that it didn't matter who took care of the job, it just needed to be done? Whatever the answer, he was definitely the man to get the job done! In the final scene, he singlehandedly took on everyone left in the town, even the man with a gun, without fear. If one man can do all that he did, he sure seems a good candidate for killing everyone. Yet, I'm still not certain he was the best to decide the massacre was needed, whether he carried it out or not.